This episode we will be looking at another attack on the Isonzo when the Italians launch what will become known at the 8th battle. This time the Austrians would once again be pushed further right up to the breaking point however, they would also once again barely manage to hold the line against the Italian attacks. The second half of this episode will then focus on a discussion of morale and discipline in the Italian Army during the war. For this topic we will take a look at the subject from when Italy entered the war in 1915 until the end, and then talk about how the actions of Cadorna and the Italian army were looked up by the post-war Italian government. The subject of morale is a topic that we will be talking about a lot for pretty much the rest of this podcast, with the French mutinies, the Russian situation, and then the race to the end of the war with the German and Austrian armies suffering an almost complete morale collapse in late 1918. But the Italian Army provides a bit of an isolated story, so that is what we will focus on today. This episode however we will be looking at another attack on the Isonzo when the Italians launch what will become known at the 8th battle. This time the Austrians would once again be pushed further right up to the breaking point however, they would also once again barely manage to hold the line against the Italian attacks. The second half of this episode will then focus on a discussion of morale and discipline in the Italian Army during the war. For this topic we will take a look at the subject from when Italy entered the war in 1915 until the end, and then talk about how the actions of Cadorna and the Italian army were looked up by the post-war Italian government. The subject of morale is a topic that we will be talking about a lot for pretty much the rest of this podcast, with the French mutinies, the Russian situation, and then the race to the end of the war with the German and Austrian armies suffering an almost complete morale collapse in late 1918. But the Italian Army provides a bit of an isolated story, so that is what we will focus on today. Before we just into the plans for the 8th battle, here is a quote from John Macdonald from his book Caporetto and the Isonzo Campaign which is something I always try and keep in mind during these discussions about the Isonzo battle, but perhaps I don't do as good of a job as I could when it comes to presenting it in the episodes since the breaking of the action into battles is such an easy way to organize the information "Though history has defined the campaign as a series of separate battles or offensives, from the point of view of the soldiers the war was one long struggle that continued on a daily basis. High-explosive shells caused a daily hail of rock splinters, aircraft often bombed or strafed the trenches, and snipers on the high ground lay in wait for the slightest movement. The unrelenting stress was seriously affecting the morale of the front-line troops on both sides. In the Italian forces there was growing evidence that the malaise ran deeper, but Cadorna gave his soldiers little time to ponder on their fate and kept them busy consolidating their gains, digging new trenches and preparing new supply dumps. To his way of thinking, the period after the Seventh Battle was just a pause to integrate replacements, replenish supplies and increase the number of troops and guns that he could bring to bear on a dispirited enemy." For what would be known to history as the 8th Battle Cadorna planned a two pronged attack. The main effort would be on the norther Carso, with supporting attacks both to the south on the southern Carso and to the north just to the south of the newly captured Gorizia. In practice it would end up looking a lot like the 7th battle when it came to execution and results. On the Austrian side, Boroevic was once again just frantically repairing all of his defenses after the previous battles. He not only needed to repair the front line defenses but he was also trying to create a second line of defenses as well. This would be positioned to the east of the Carso and would be used in case of the first line being lost to the Italians. Of course he also was constantly asking for more troops and for once Conrad was actually on his side and was trying to get more troops sent to the Isonzo. However, it was the Germans that were now blocking this movement. The only way to produce more Austrian units to be sent to the Italian front was to take them from somewhere else, specifically the Russian front. 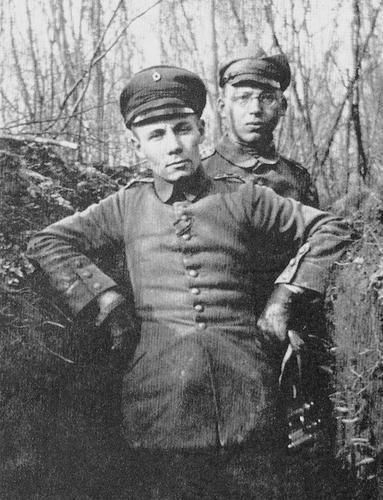 This required German permission by this point in the war since they had taken over the control of most of the front following the disaster that was the Brusilov offensives earlier in the year. Hindenburg and Ludendorff were never keen on giving Conrad more troops to send to the Italian front since they did not have any real control of what would happen with them once they arrived and so all that would be given to Boroevic in this case was 2 division. This helped him, and I am sure he was glad that they arrived, but such a small number meant that he would still be outnumbered almost 3 to 1 on the Carso when the attack was launched. The artillery fire began on September 30th and would last for over a week. It would not be completely constant during that time, much to the chagrin of the Italians, due to some breaks due to weather. Even with these breaks the concentration of artillery on such a relatively short front was devastating. This artillery caused 4,000 Austrian casualties before the attack began. All of this fire came to a conclusion on October 9th. At this point every gun fired at maximum speed for most of the day, this was then followed by probing attacks in the afternoon to try and find weak points. Then on the next day the same thing happened, with a massive final barrage before the infantry began their way forward. This attack had the benefit of taking place on a very foggy morning, which cloaked the Italians as they moved up to the Austrian trenches. The defenders really just did not have much of a chance. To the south of Gorizia the dazed defenders were pushed back almost a mile to the next set of defenses. On the northern and central Carso the results were much the same. It was only on the southern Carso that the Austrian lines held mostly firm. On the 11th further Italian attacks captured yet more territory, mostly on the northern end of the offensive near Gorizia. It was at around this point that the attacks began to lose steam. Cadorna first widened the area of the attack, diluting some of his artillery strength. Then the fog continued, which after the initial attack had began shifted from being an Italian advantage to an Austrian advantage due to the their ability to counter attack with little notice. Over the next day the counter attacks, and the Italian attacks to counter those counter attacks were launched in large numbers along the front, these were generally small actions and they prevented a larger Italian breakthrough. However, they were also extremely costly in terms of men for both sides. On October the 12th, instead of continuing the attack, something that the Austrians feared he would do, Cadorna called it off. The casualties for the battle numbered 60,000 for the Italians and 38,000 for the Austrians. However, as had been the case almost every time the Austrians had stopped the Italians with only some loss of territory. But of course, just like always, stopping the attacks had taken most of the Boroevic's reserves so that now he needed even more troops that could be fed into the Isonzo meat grinder. Even though it was by this point the middle of October and winter was swiftly closing in the 8th battle would not be the last on the Isonzo for 1916 and unfortunately for the men all they could do was shelter in their defenses, many of which had been damaged in the fighting, and try to stay warm in the Alpine winter which was descending upon them. We will cover the 9th battle, the final one of 1916, next episode. We now shift over to our discussion about morale and discipline in the Italian Army, and because of this I need everybody to think all the way back to 1915 when Italy entered the war. During that year of fighting the Italians would suffer 400,000 casualties, of which 66,000 would be killed. This was, in short, a very rough year for the Italian Army. However, I think that sometimes numbers that large can cause us to lose our sense of context, so lets break it down even further by looking at just one Brigade, the Polenta Brigade, something they were called because their colors were yellow. When the war started this unit had a strength of 130 officers and 6,000 men, in May 1915 it would become involved in the fighting on the Isonzo. Over the course of 7 months it would man the front from June and July and then spend 3 punishing months on the hills around Podgora. These would be the areas that would see so much fighting in 1915 as the Italians attempted to take Gorizia. During these 7 months they would suffer casualties amounting to 154 officers and 4,276 men. This represents well over 100% loss of officers, at 154 vs 130, and it also is a bit over two-thirds of the enlisted men. Not all of these casualties were just during battles, and many of them were just general wastage casualties due to the difficulty of manning the Italian front lines in 1915. Most of the Italian positions were exposed to Austrian fire, since they were at a generally lower elevation. The Austrians much like the Germans on the Western Front had the opportunity of choosing where they fought which meant that they almost always were in better positions during the Italians. To add onto this difficulty was how neglected quality of life at the front was among Italian officers. Here is Mark Thompson from his book The White War to discuss why life was so horrible at the front, even when the Austrians were not shooting at them, "Sweat, dust, mud, rain and sun turned the men’s woollen uniforms into something like parchment. Their boots often had cardboard uppers and wooden soles. Lacking better remedies, the men rubbed tallow into their cracked feet. Helmets were in very short supply. The wooden waterbottles were unhygienic. The tents - when they had them - leaked. The wire-cutters were almost useless, and unusable under fire: ‘mere garden secateurs’, as a Sardinian officer wrote disgustedly in his diary. Ration parties were often delayed by enemy fire. The only hot meal was in the morning, and so poor that soldiers often rejected most of it. The pervasive stench could, anyway, make eating impossible. The effects of such poor nutrition were evident after three or four days in the trenches, and some units sent out raiding parties for food and clothing in trenches that the enemy had abandoned. The soldiers slept on straw pallets, but there were not enough to go around. Even in the rear, before proper hutments were built, the men lived in tents that quickly became waterlogged and filthy. Abysmal medical care led to ‘a good number of avoidable deaths due to inhuman treatment’. Wounded men were routinely ‘shipped on 20 or 30 km ambulance runs on vile roads and then kept waiting for hours outside hospital’." I bring up both the casualty rates and the quality of life because they are critical to understanding why Italian morale was at times so poor and also why the Italian leadership felt they had to be so harsh when it came to discipline. The first true mutiny would occur in December 1915 and it would happen in the Ferrara Brigade. The situation for this unit was not that much different than what we discussed with the Polenta brigade, they had been in the line for a good portion of the year and they had lost many of their men. By the time they were brought off of the line there were only 700 combat effective men left, and of those 200 where given leave to rest and recuperate, but the rest were all sent back to the front. When the soldiers were destined for the front found out about the plan they mutinied and shots were fired by the soldiers. Order was eventually restored and a court martial setup to try those involved. Two soldiers would be shot just a few days later as punishment for the mutiny. The fact that these troops mutinied is actually somewhat extraordinary since their complaints and their treatment was not much different than what the other units were experiencing. They wanted more leave, especially leave that allowed them to go home, and they wanted better conditions at the front with better food and cloths. That these very same complaints would be present for almost the entire war and there were so few mutinies or other issues is a testament to the Italian disciplinary methods. So let's jump into what those were. Right from the start of the war discipline was high on the list of priorities for the Italian army leadership. In 1914 the army was still using the Italian Penal Code of 1859 to guide its actions. This involved a lot of military tribunals and influence from higher commanders. The disciplinary actions were then carried out by the carabinieri, or military police. The precise scope of these punishments can best be described as draconian. Throughout the war the Italian military leaders constantly fell back on a more traditional preference to extreme discipline rather than any more progressive ways to manage morale. This resulted in even simple complaints about officers or rations carrying a result of 6 months to a year in prison if they filtered up the chain of command high enough. And this was in many ways on the lenient end of the spectrum. One Italian Corps Commander believed that the massacre of the infantry was a 'necessary holocaust' and that it was therapeutic, strengthening the army in the process. Obviously this made him less than amenable to men who tired of seeing such slaughter up close. The constant need for military tribunals meant that early in the war a permanent court martial was setup to try all enlisted men and this court was under the influence of Cadorna, who as the supreme military leader of Italy had a lot of power when it came to shaping Italian disciplinary procedures. Cadorna, to put it bluntly, believed that discipline was the core of the army and that if should be enforced with as much violence as was necessary to ensure compliance. Early in the war he would issue a memorandum that would say "every soldier … must be convinced that his superior has the sacred duty to shoot all cowards and recalcitrant immediately." He believed that not only was discipline necessary, but it was also the only way to keep morale high and he even placed its importance over that of training and tactical acumen when it came to making the army successful. He also believed that it was critical that officers in the field felt empowered to execute summary sentences when it was necessary and that if they were too weak or tolerant to carry out those sentences they should be removed. This incentivized officers to be as harsh and cruel as possible, otherwise they might just be removed and mothballed in disgrace. Cadorna would also use his position to criticized the military tribunals if they were too lenient. After the Fifth Battle of the Isonzo he openly criticized these tribunals and told them to ratchet up their punishments. During the battle of the Trentino Cadorna would write to one of his commanders directly as a way of telling them how he thought they should handle the morale crisis that many Italian units were having at the time "Y[our] E[xcellency] should take the most energetic and severe measures, if necessary, shoot at once and without trial those guilty of such enormous scandals, no matter what their rank.’23 The first of five known cases of killing by lottery (two of which were specifically decimation) followed almost immediately: a lieutenant, three sergeants and eight men were selected by lot from a company which had broken under unexpected attack and shot." While this was happening at the front for most of 1915 very little information about these practices was finding its way back to the home front. Right from the very start every letter from the front was heavily censored by the military and this prevented realistic portrayals of what was happening from reaching the families of those in the trenches. However, nearly the end of 1915 a large group of men were sent back home on leave for two weeks and it was at that point that information began to filter out to a wider public. This produced a marked downturn in support for the war from those at home. Now, the situation on that home front was already divided, mostly along class lines, but with information about how the men were being treated at the front these divided became worse. Cadorna and the military had prepared for this though and they already had put in place a network of agents to keep tabs not just on the civilians of Italy but also on the civilian government. They were assisted in this task by some members of that civilian government in Rome. They would use this support in Rome to push through a measure that criminalized defeatism which would be defined as an extremely broad term that would end up being used to prosecute anybody doing anything that the military did not approve of. The only people who were in a position to raise concerns about these types of changes were those in Parliament who did not agree with them, but they found their voices muffled by those who supported the military and their efforts to maintain control over the country. Even though Cadorna took a very hard line on discipline the situation at the front did begin to improve for the men after early 1916. After the winter of 1916 the soldiers were finally finding that a reasonable number of cold weather clothing like overboots, heavy leather boots, and greatcoats were available to them. The lack of these had been punishing for those in the front lines during the long and cold Alpine winter, not helped by the serious shortage of woolen socks. While these new clothing options were appreciated the greatest change was made in the length of tours of the front line. In 1915 troops had spent most of their entire time in the front line trenches or immediately behind, but for 1916 there were changes. Front-line tours were shortened to just 15 days and then they were rotated out in stages, first to the second line, then to the reserves. While all of these changes made the situation at the front bearable for the men it would not prevent other morale issues from popping up as the war continued. 1917 would be a particularly bad year for Italian morale and military obedience from the troops. During the summer there were many instances of troops going to and from the front getting in fights with the carabinieri, sometimes even shooting at them. This eventually led to the men's rifles being taken away before being sent on leave, which just resulted in them throwing rocks and bottles instead. The number of deserters would triple between April and August 1917, which was never a good sign, and then of course Caporetto would happen which would throw the entire army into disarray, a phenomenon which we will discuss here in just a few episodes since it plays such a critical role in the story of that battle. Overall, of the roughly 5.2 million Italians mobilized into the armed forces for the war, 870,000 faced some form of charges for military crimes, the largest of which was desertion. Of these some 4,000 were condemned to death, and then 750 of these death sentences were carried out. This is a relatively small number when looking at the totals, but they also tell only part of the story. These are just the official numbers that were documented and does not account for the summary executions in the field performed by officers and men against their comrades. In January 1916 the old Roman practice of decimation was introduced into the Italian army as a way of dealing with units that were seen as having failed. This, when combined with the orders from Cadorna for officers to shoot deserters at the front combined to probably kill many more than the 750- men officially executed for their crimes. I did not find an exact number on these informal executions, and it is unlikely that we will ever know their full extent since often those killed for their actions at the front were not separated from those killed in action. As with all things in the war, we must take a cold and calculating look at what these actions resulted in. Some post-war scholarship argues that Cadorna's iron fisted approach to discipline likely kept the Italian army from having a larger mutiny. And it is definitely possible that without these measures the Italians would have ended up with a larger French style mutiny on their hands during the war, we will just never know. What we do know is that after the war the Italian Army's Judge Advocate General ruled that most of Cadorna's directives were illegitimate which would eventually result in a general amnesty for deserters in September 1919, and a commutation of several other sentences. I hope that this half of the episode has been interesting and informative, military morale and discipline would take center stage in many armies in the last 2 years of the war and we will dive into this topic in those armies in greater detail in later episodes, with the French and Russians in 1917 and then the Germans in 1918. Thank you for listening and I hope you will join me next episode as we close out 1916 on the Italian front with the Ninth Battle then a bit of information about what happened during the winter of 1916 and 1917.